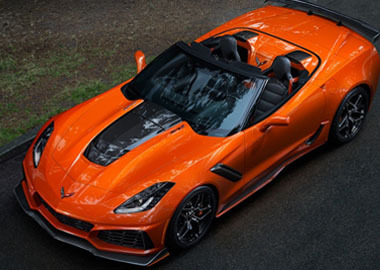 This latest legend offers the ZR1 in a convertible body style, though it’s an addition that was anything but an afterthought. The ZR1 suspension was tuned specifically to this top-dropping iteration to ensure peak performance. And the top retracts at speeds up to 30 mph. Fitting for a supercar in which the sky is the limit. 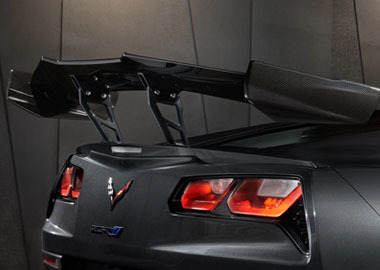 The stanchion-mounted carbon-fiber high wing creates about 60% more downforce than the current Z06 with Z07 Performance Package while maintaining similar drag. It can be mechanically adjusted up to five degrees for different levels of downforce. Standard GT bucket seat provides excellent support, while available Competition Sport seats feature pronounced side bolsters for extreme cornering. Available Napa leather seating surfaces feature precision hand stitching and sueded microfiber accents to help create your perfect driving environment.